Soon after his brother left the partnership, Hendrick created the Mascot brand for his fishing reels. The name was trademarked by Isaac Boothe, but not until 1890. The reel shown on the home page of this site is an "Imperial Mascot." 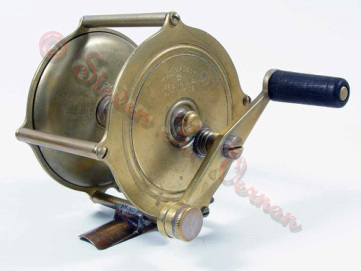 It was made of plated brass and hard rubber, imitating the style of Julius Vom Hofe's reels, and it was probably Hendrick's top-of-the-line. 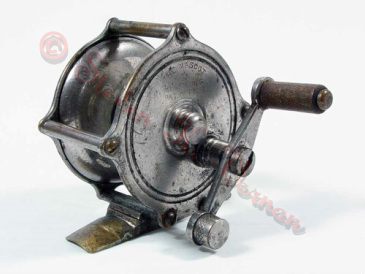 The Mascot reels shown below provide a hint of the variety of reels Hendrick was producing. 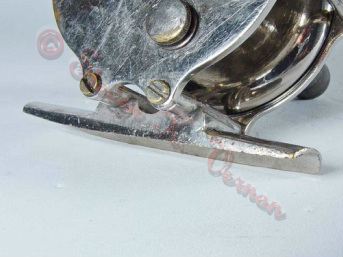 Reels marked with the Mascot trademark were made after 1890. 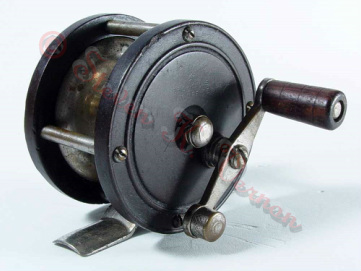 Two similar, raised-pillar Mascot multiplying reels. 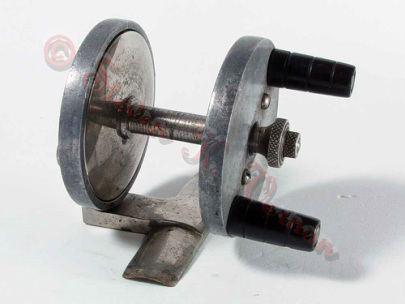 The arrow-shaped brake and click levers of the earlier reels have been replaced by conventional sliding buttons. 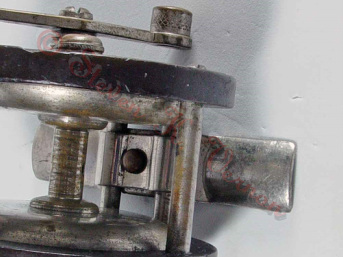 The left reel is marked on the headplate, the right reel, on the tailplate. 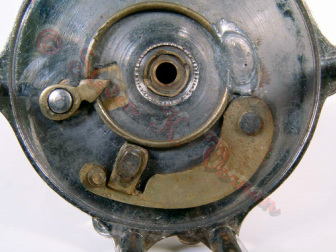 The clicks and brakes in all Hendrick reels were made cheaply. Those in collections often don't work properly. 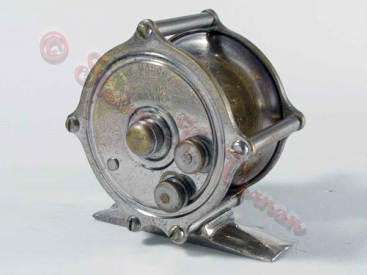 The swaging marks for the gear and bearing are typical signs of Hendrick manufacture. On the right is the Mascot trademark. Two styles of foot seen on Mascot reels. The foot on the left is cast and has grooves in which the cross-pillars are seated. The foot on the right has a plate riveted to the stamped and formed foot below. Both pieces are corrugated to fit over the pillars.